With the injury to Thedore, Florida has made their second call to AHL affiliate San Antonio in the last week, bringing up Jacob Markstrom to back up Scott Clemmensen tonight. The Panthers also had to call up defenseman Tyson Strachan, due to an injury sometime before game 4 to Jason Garrison, which resulted in Keaton Ellerby, who had been a healthy scratch every game since March 15th, getting the start. Unfortunately, Ellerby was subsequently struck with an “injury,” and Florida inserted Strachan. Strachan does have 82 games of NHL experience over 3 seasons with the Blues and Panthers, but Jason Garrison is hard to replace. He led the team in power play goals over the season, and was a big part of the Panthers early success on the PP in the first 3 games of the playoffs. The team is calling the injury to Theodore minor, saying that it’s a bothersome knee that Theodore has been dealing with all season. But this is the playoffs, and it’s all about mind games. Earlier this morning, Richard Chere of the Star-Ledger (NJ) tweeted that Clemmensen confirmed to him that he will be starting. Minutes later, however, head coach Kevin Dineen did not rule Theodore out, saying Theodore was simply given the morning off. With game 6 mere hours away, you would think if Theodore could give it a go, he’d be in net, especially coming off of a game 5 shutout and the Panthers on the verge of their first playoff series win in 15 years. Nevertheless, with Markstrom being recalled, it has all the feel of Clemmensen being in net for Florida tonight. It would be his 2nd start of the series and 3rd appearance. His relief stint of Theodore in game 3 resulted in a remarkable 4-goal outburst from the Panthers, erasing a 3-0 deficit. His first career playoff start, however, did not fare as well, and Florida was on the wrong end of a 4-0 game 4 decision. Not to be overlooked is Florida’s AHL affiliate, the San Antonio Rampage, are in a Calder Cup playoff series of their own. With Strachan already missing, losing their starting goaltender cannot be going over well in the Lone Star State. Of course, the parent company takes precedence, and call-ups were a big part of Florida’s year. 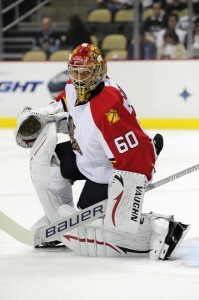 During the 2011-2012 season, the Panthers played 23 different forwards, 10 defensemen, and 4 goaltenders. Needless to say, the Rampage players that recorded time with the Panthers had a lot to do with their success, so it would only seem fitting that a couple would be called upon in the postseason. At the time of this being written, according to Dineen, Jose Theodore and Keaton Ellerby are still questionable, and Jason Garrison is out. Tyson Strachan and Jacob Markstrom are with the big club and are available. Stay tuned throughout the day, hours, and minutes leading up to game time because the injury report could change at anytime because, you know, it’s the cup.